I bet you’ve never seen a karate tree. I hadn’t either. But this is a do-it-yourself addition to your d0-it-yourself kid-gym. 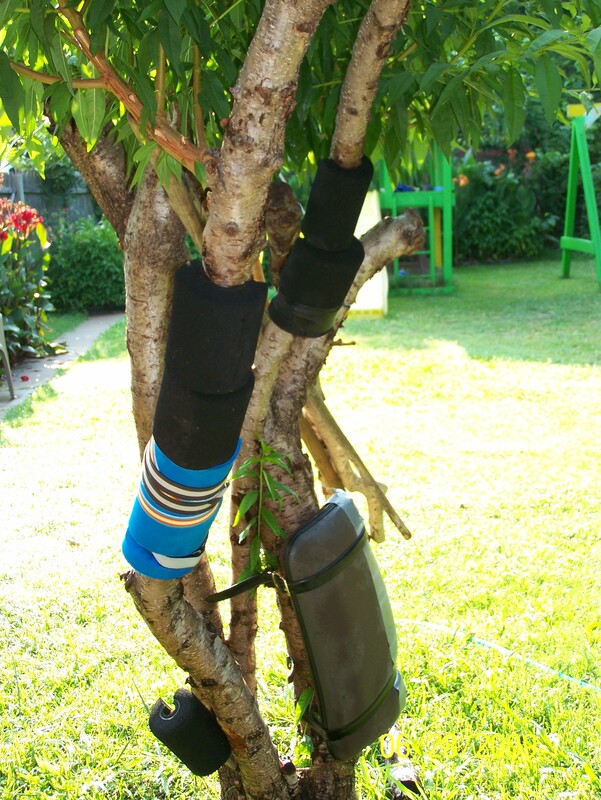 You don’t need to spend a dime – other than buying the duck tape to strap your pads to the tree. Who said you needed a fancy gym! Kicks and punches now have a place to land during the long summer days at home (instead of landing in pesky little brother’s head or stomach). The kids can take out some frustration, expend some pent-up energy, improve their self-defense skills, and even get into better shape – – – all in the comfort of their own back yard. You, as parent, could even take a nap during their work-out. But just a warning – make sure they have boxing/karate gloves and pads. Emergency room visits are not an intended result of this training! If you laugh at their lame attempts to hit and kick the tree, it makes them want to kick and punch twice as hard. Humiliation causes anger, and anger does wonders for a good work-out. Have fun! !